Updated Sept. 17, 2015 at 12:35 am: The official text of motions made at the Committee Meeting came in by email just after I posted the original article. They have been appended with comments. Rob Ford may not be Mayor of Toronto, but his era left a hangover from which transit (and much else in the city) has yet to recover in the attitude that almost any spending is an affront to taxpayers, and that the first goal of any budget should be to spend as little as possible. That makes for good political showmanship and sound bites, but it is not a truly businesslike managerial approach we should expect from Mayor Tory. What is missing, of course, is any sense of what transit, what Toronto should be, or of the investments the city needs. The TTC wrestles with a regime that rewards frugality with the possible exception of proposals that provide photo ops for otherwise miserly politicians. 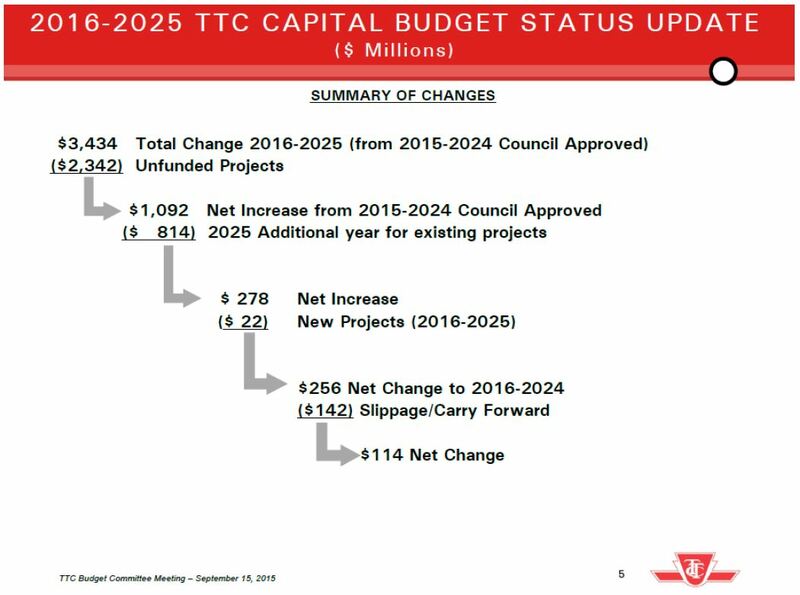 The proposed operating subsidy for the TTC in 2016 is flat-lined at its 2015 level of $474-million even though inflation, population growth and full-year operation of 2015 service improvements will add to ongoing costs. Tax-averse politicians love to freeze fares, and even run on this in election campaigns, but are slow to pay the bills when fares don’t make up the needed revenue. The City’s headroom for borrowing will max out against its own debt target that no more than 15% of tax revenue should go to debt costs. This will choke off a significant source of capital funding for routine TTC maintenance which already suffers from low support at the provincial and federal levels. 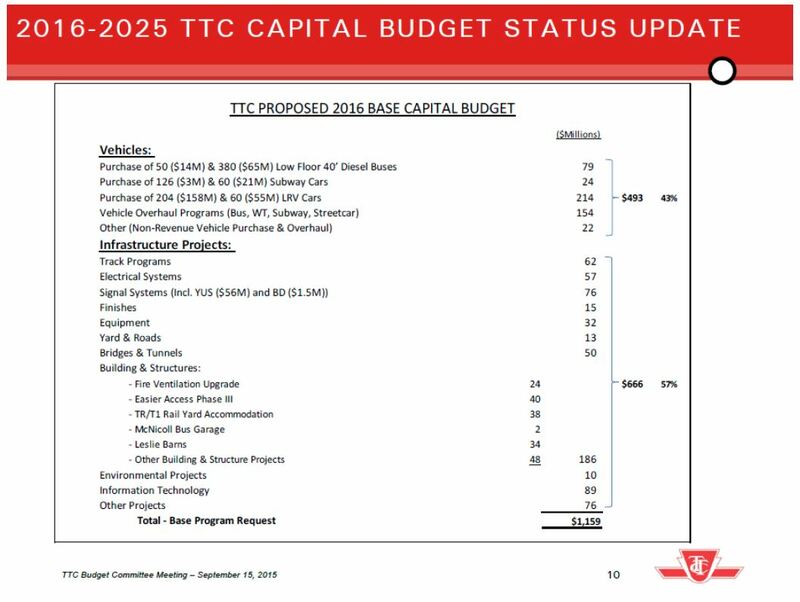 TTC budgets underplay the true need for capital funding by placing projects “below the line” (for which there are now at least three sub-classes of project) in an attempt to make the City’s future borrowing exposure look healthier. This article discusses the Capital Budget for 2016-25. I will turn to the Operating Budget and related reports in a separate post. About 1/3 of the “base” capital budget has no funding from the City of Toronto, and several projects remain without approval due to this shortfall. 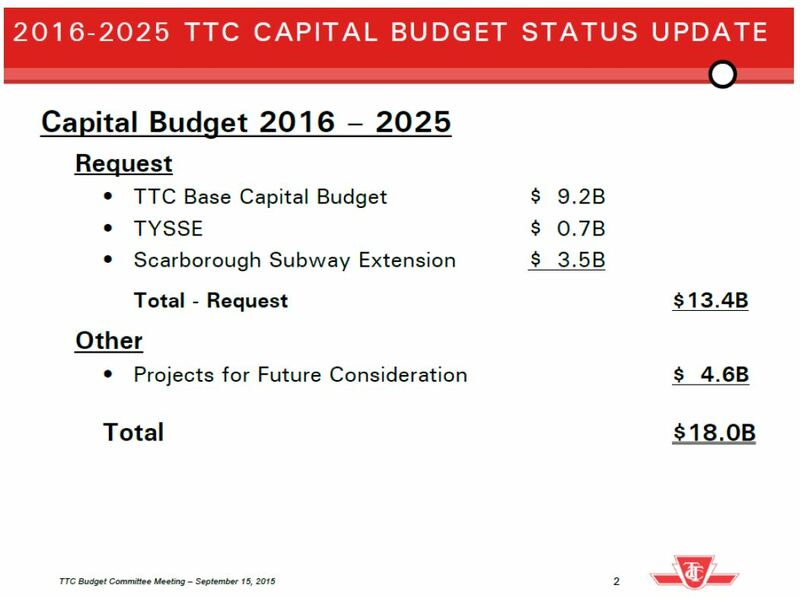 The TYSSE (Spadina Subway extension) faces additional costs, but these are not yet factored into projections. This is a shared-cost project with three other governments. The SSE (Scarborough Subway extension) probably will face additional costs through “add ons” such as a fourth station. Any increase in the project cost will come from Toronto taxpayers who are already paying a transit property tax to finance this line. Projects for “future consideration” include a list (discussed later in this article) that both under- and over-counts some potential costs, but which most importantly includes little sense of priority nor timing that would affect budget planning. Not included here are about $1b worth of projects that would be funded through Waterfront Toronto funding for which would come, at least in part, from the City budget. Almost all of the “base” budget is “state of good repair” – routine capital repairs to worn-out infrastructure and systems, as well as technological upgrades. Some of the items in this list represent projects already in progress while others are future works that are just ramping up (e.g. McNicoll Bus Garage) or are only at the planning and design stage. Many projects are unfunded and have yet to be approved by City Council. In the short term, this isn’t a problem because the items in question will not start until future budget years. The timing of spending on these projects would vary considerably, but is generally in the latter 5 years of the 10-year plan. For example, the 372 subway cars are replacements for the T-1 fleet now operating on the BD subway. These cars have 15 years left on their service lives, and replacement would not begin until the mid-2020s. Delivery of the 60 streetcars would not begin until at least late 2019 when the current order, in theory, will be complete. However, lead times for contracts will require decisions to commit to some of these projects well before significant spending occurs. 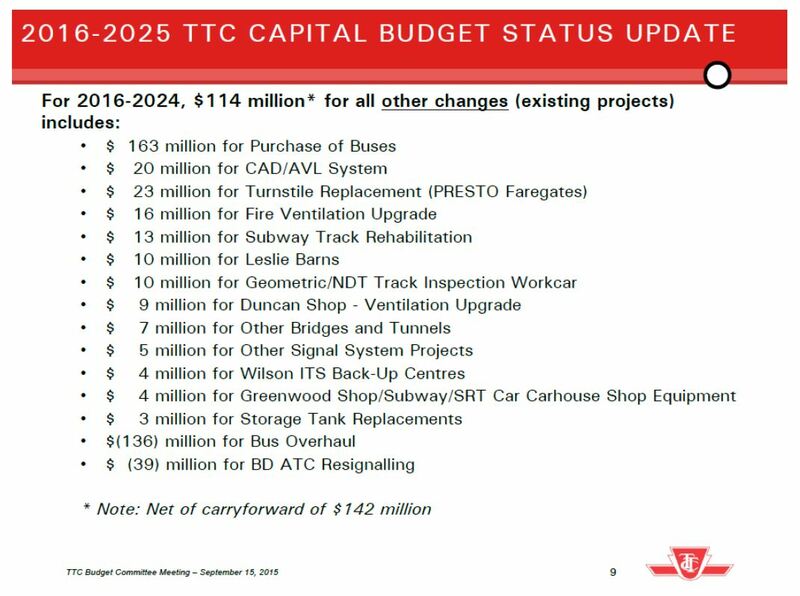 A related problem is that those “out years” of the budget will soon be “in years” and the accounting fiction that things like track repairs can simply be placed “below the line” will stare Toronto Council in the face. The capital budget for 2016 sits at $1.159-billion, roughly 1/6 of Council’s total project approvals. This shows how the spending of available funding is front-end loaded. Spending on projects already underway cannot be avoided, but the need to approve and fund the “below the line” projects will grow quickly. The annual budget request drops off in future years as some major projects ramp down. However, capital needs do not vanish, and the lower levels in the early 2020s reflect the fact that spending on the “unfunded” project list above would lie in these years. The City’s debt target calls for no more than 15% of tax revenues to pay for debt costs. 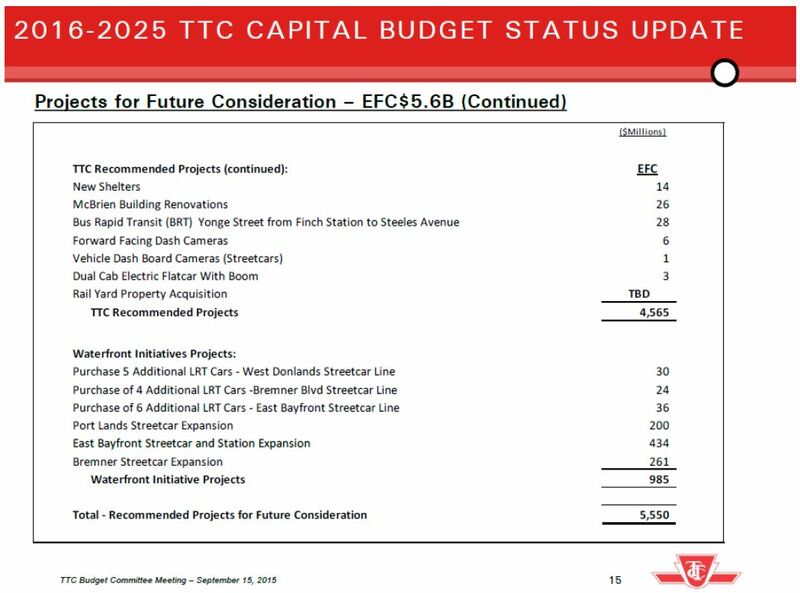 All of the headroom will be used up in the near future, and the space allocated to the TTC in the borrowing plans falls to zero by 2022. The “Other Funding” line includes project-specific funding, and this dries up in the early 2020s. Much of what remains comes from Development Charges, the Provincial Gas Tax ($70m) and Federal Gas Tax ($150m) which are presumed to be unchanged for purposes of these projections. The combined effect is that by the 2018 budget year, there is a shortfall and that leads directly to the placement of many projects “below the line” from that year forward. A rather confusing “waterfall chart” in the budget presentation baffled committee members. The plan included spending for 2015 which is no longer part of the budget, but there is a new “year 10” which adds in to years 1-9 of projects already approved. Some new projects add to the budget, and some 2015 spending plans will actually slip to future years because of project delays. The net increase is $114m. This is a confusing way to present the information because all of the “ins and outs” of various budget components are not evident, especially the derivation of the starting number which does not appear anywhere else in the presentation. 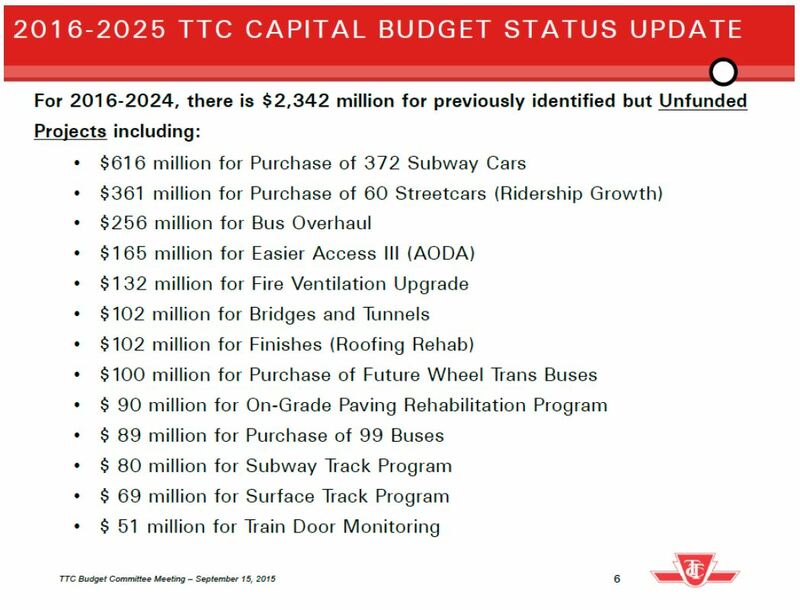 At this point, we are supposed to cheer because TTC management has done such a good job, but it is unclear just what the $114m figure above signifies. After all, without the slippage from 2015, the delta would actually be $256m. Another point about that $114m is that it is considerably reduced by some offsets, notably the elimination or deferral of bus overhauls. The entire question of bus overhaul frequency and number has yet to be settled at the TTC, and provisions for this come and go in budget estimates. One cannot help thinking this is as much an exercise in making the numbers come out acceptably as it is coherent planning. Note also that the Bloor-Danforth ATC project gets shunted aside, and we have to wonder how this can be done with a project that is supposed to be critical to future operations and service quality. One line in the “unfunded” list is the Easier Access program to complete elevators at all stations. This has been held hostage by the TTC and City in an attempt to shake money loose from Queen’s Park rather than simply recognizing the project’s importance and building it into the base program. The planned lifespan of a bus affects ongoing capital maintenance costs, spare factors and annual fleet replacement costs. 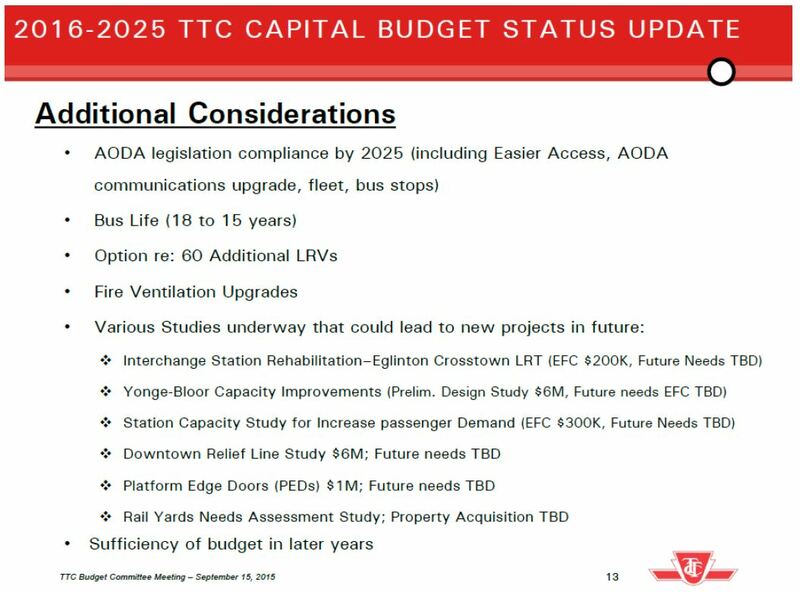 The TTC has discussed reducing its planning life for the fleet, but this ran into opposition at the City at least in part because it would accelerate the replacement of a large chunk of the fleet whose age falls in the critical window. The additional 60 Flexities (leaving aside issues with Bombardier as a vendor) are needed for service and system expansion. Fire ventilation upgrades go beyond the scope of the “second exit” program to add or upgrade existing fan systems to clear smoke from tunnels and stations in case of fire. This is a question of bringing the system to current fire code, but it is a very expensive project. Some of the details appear in following pages. There is no prioritization of items on the list nor of components within complex projects. Some items such as Yonge-Bloor capacity and Platform Doors are directly linked to future demand levels on the subway. If demand is redirected to another line such as the proposed Don Mills to Downtown Relief line, then these costs should disappear from the list, or at least not be counted concurrently with the future cost of a DRL. Additional streetcars for the waterfront lines have been in the budget for years, but it is unclear whether these are separate from the 60 car add-on order contemplated for the Flexities. Park Lawn Loop is included in this list, but with the pending extension of frequent service west of Humber Loop, this loop may not be required. There is provision in the SSE budget for a new subway yard (although it may not actually be located on the Scarborough line itself). 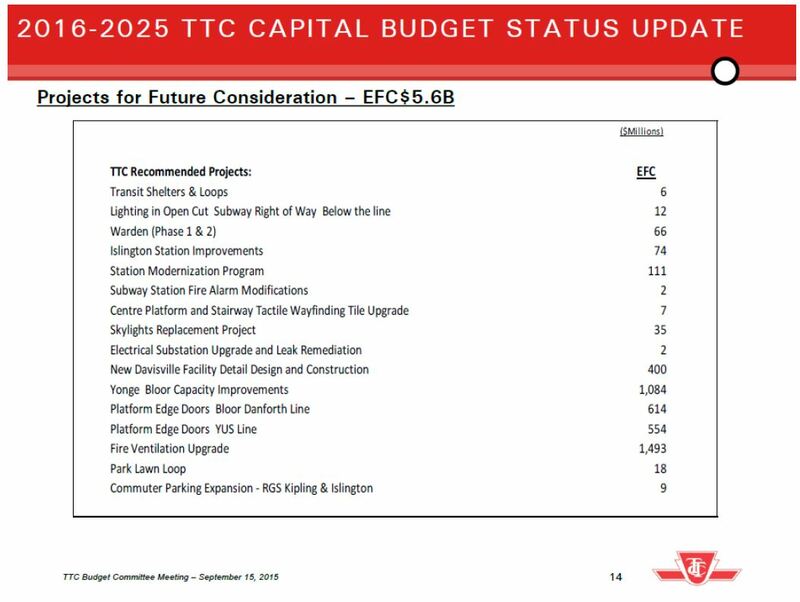 $4.565-billion from this list shows up in the budget summary at the beginning of the presentation, but the Waterfront Initiatives are omitted as their funding would come through Waterfront Toronto. This is a strange approach considering that the SSE and TYSSE projects have their own section in the budget and they are shown as funded through various sources. What has been missing in the Waterfront projects is any sense of urgency, the detailed planning needed to identify which of these projects should actually be scheduled and for which time periods. The Bremner Streetcar is troubling because the proposed alignment for the route is difficult, and it is unclear how this will ever actually be built. The DRL does not appear in these projections beyond its mention in a study because the project is unlikely to start within the ten-year window of the budget. All the same, it needs to be viewed as a future possibility including offsets against other projects that a DRL could make obsolete. Unlike the DRL, the SmartTrack scheme does fall within the 10-year window, but it is not a TTC project. A fundamental problem with TTC capital planning is that there has never been a discussion of how everything fits together, of priorities, and of the truly “must have” projects regardless of whether we know how to pay for them today or not. Only if we know what our total funding needs are, and agree on what should (and by implication should not) be built, can Toronto as a city make intelligent decisions about its transit future. The TTC budget should not be an exercise in minimizing Toronto’s supposed future spending and borrowing needs, but of showing what these really are. If we choose not to pay for them either through local taxes or through funding schemes from other governments, so be it, but at least we will have the opportunity to debate the decision. In the second section of this article, I will review the Operating Budget including proposals for new fare schemes and service improvements. Request TTC staff, working with the City of Toronto Manager, and Waterfront Toronto, to prioritize the East Bayfront LRT project, and to report back to the TTC’s Budget Committee on how to expedite the work, starting with the planning and engineering work. Request TTC staff to report back to the TTC on its bus procurement strategy and the growth assumptions inherent in the plan. Request TTC staff to report back on a prioritization framework for unfunded capital projects based on business case, safety/risk management considerations, project readiness, growth and other related criteria. The waterfront projects, especially the East Bayfront LRT, have languished throughout the Ford administration thanks to its antipathy for both Waterfront Toronto and for streetcars. Developers in the area, particularly for commercial properties, are concerned that without good transit, a better connection to the core area than the Sherbourne and Bay buses, developments are not marketable. The motion regarding bus procurement and growth assumptions speaks to the question of whether current fleet and garaging plans are adequate for anything beyond minimal projected growth. The motion regarding unfunded projects speaks to the general issue raised in the main article about the amount of money, timing of spending and the priority of actually moving these works back “above the line”. Wow, will the current switching system, not be nearly as old as the Yonge one was, when they started that project, by the time the Yonge system is fully replaced. This really needs to be something that is explained, and will hopefully not result in huge issues 10 years from now. I can’t find anything about the two-hour transfer implementation. Is that hidden away in some appendix somewhere, to be burst on the scene at some later date, with the expected abdominal pains. Steve: If anywhere, it will show up in a report on “fare equity” that is coming to the Commission later this year. Any indication from what was said during the presentation about the 60 new streetcars where TTC is at on this? I was surprised they weren’t pushing it harder, given that it’s likely that we’ll be getting the 60th car by about this time next year, which will trigger the option expiring. Perhaps this is a sleeping dog they’d sooner let lie, until later in the budget cycle by which time hopefully Bombardier has demonstrated they can actually ramp up production to the required level. Steve: I was not able to stay for the entire meeting, but there was no mention of the streetcar order status while I was there. This may come to the next full Commission meeting later in September. Presumably low fuel prices do not reduce the TTC’s costs very much. Is this because of hedging? If fuel prices stay low after the TTC’s hedging contracts run out, will this reduce the TTC’s costs significantly? 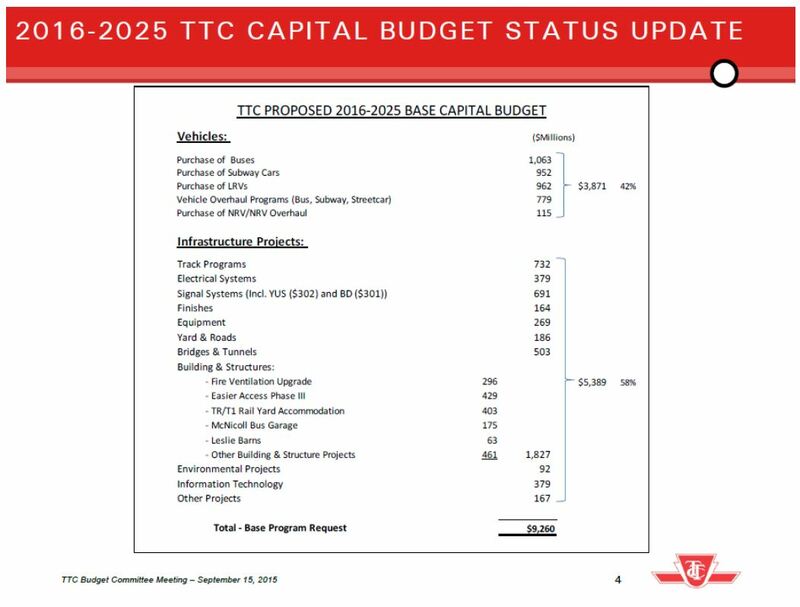 Steve: The TTC (together with the City) do hedge their purchases and have much of their fuel supply already locked up for 2016. This shows up in the Operating Budget (the subject of the next article) as a saving. I would suggest that borrowing money for routine maintenance is a Very Bad Idea. Steve: When I say “routine maintenance” I am not talking about minor things like cleaning stations, but capital projects to replace or rebuild vehicles and infrastructure. Running maintenance of buses is in the Operating Budget, but major rebuilds are in capital because their value is spread over many years. 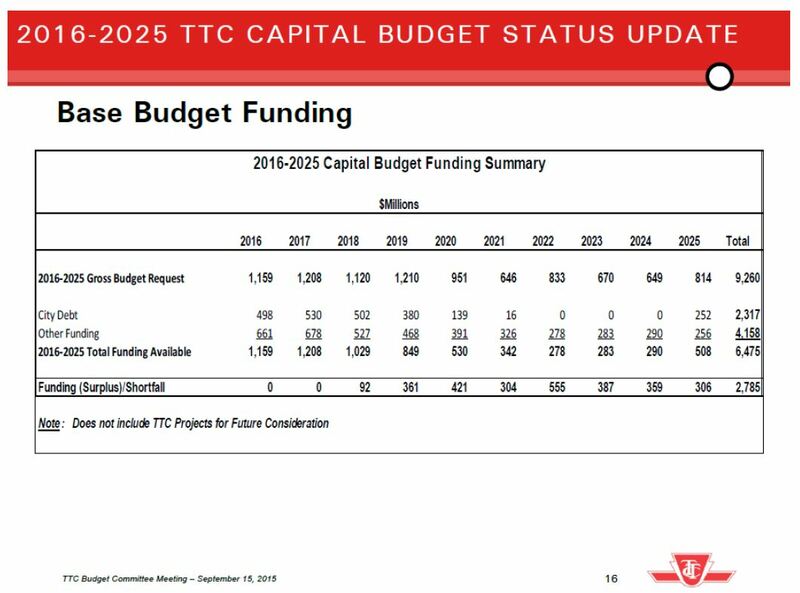 The TTC numbers also show the folly of the Scarborough Subway vs. its fully funded by the provincial government LRT alternative. Steve: Don’t let facts confuse the issue. Good to see Warden is back on the books … albeit a few years away. I doubt the project be it phase one or two will get very far but here is to hoping. According to Brad Ross this was brought up at the accessibility meeting on the 16th. Someone asked how Warden will be made accessible and was told a complete tear down akin to that of Victoria Park will be required. I hope it goes through as the station needs it but this is more than a simple reno. Warden is located in a hill with entry passageways built into the bus bays. The Kiss and Ride for example is located inside the bus bay structure whereas the other exit runs the length of the bays. To renovate the station you would need to close it … be it bypassing or instituting Victoria Park turnbacks. In a way this could be a blessing however, it would permit the station to be completed faster. When Victoria Park was being redone it was a zoo and the work was stretched out to maintain access. That said … I hope this gets done … the station needs it! Re: Bremner – “presumably” the route would travel from Union under Bay, diverging into the basement at the Air Canada Centre … while the cost would be astronomical for such a relatively short route, could it reasonably travel in-tunnel stopping at/near the CN Tower/Skydome/damned Aquarium and surface around Spadina (looping at Charlotte) or Bathurst (looping at Wolseley and creating an actual use for Wolseley)? Sorry, I know the bulk of this was lines-on-a-map-ing. Steve: There are problems going underground west of Simcoe because of the structure for the parking garage south of Bremner which is part of the convention centre to the north. Also, any route here would have to be built cut-and-cover with the associated disruption. Taking the route to either Spadina or Bathurst and then ending at a loop on those streets would be an operational nightmare because they are already very busy, especially Spadina. Wolseley is not a good terminus because it is very small. The real problem is that we (city, TTC, transit advocates, etc) must figure out just what market a Bremner line is intended to serve and whether this function can be performed by other routes such as the west end of a DRL.